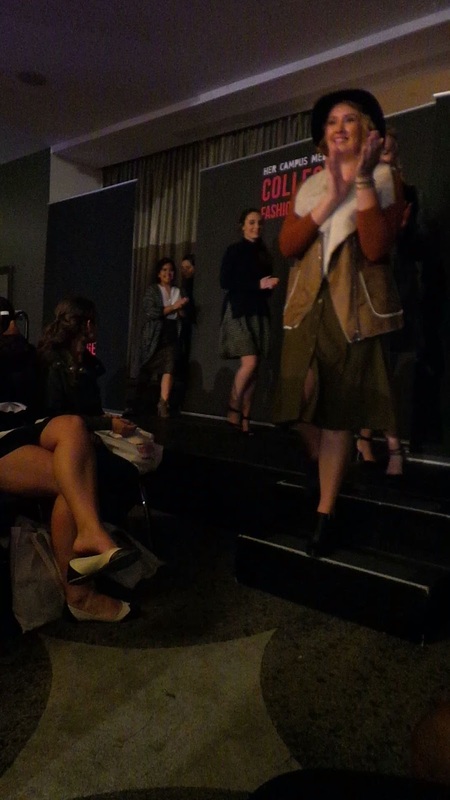 This past Saturday, 10/17/15, I attended Her Campus College Fashion Week. I went with my friend Dahlia and her friend Lauren. I had a really great time. This was Her Campus's first time in the DC area and it was held at the W Hotel in Downtown DC. What I enjoyed most at the fashion show was when we won VIP wrist bands that allowed us access to VIP seating, lol. The Co-Founder of Her Campus, Windsor Hanger Western, liked our outfits and gave us wrist bands. That was so kind of her. We decided to sit in the front row so that we can see everything. Before the fashion show began we was treated with a live performance from Allie Gonino. Some of you may know her from the television show "The Lying Game." She is also a singer-songwriter. The songs she song at the show was written and inspired by her life. After the show I told her that she sings beautifully. It was great watching her performance, she's funny. After her performance the fashion show began. What I like most about this show was that they allowed college students of all different sizes to walk the runway. The show was broken up into four scenes and each scene had it's own theme. Each scene showed you the different trends that are happening now and how you can incorporate it into your wardrobe. Windsor with her baby and the Models. I liked all of the trends. But I must say, my favorite of the bunch was the menswear inspired collection. I love the sleekness of it with an added feminine touch. I'll have to try this trend. I love mixing trends and trying trends that express and shows who I am. I left this event with two gift bags. One was a general bag that the first 400 attendees received and the second one was for VIP's. Since I was a guest first and then upgraded to a VIP I was able to receive two bags. I was satisfied. This event partnered with the first lady's and the Peace Corps movement, "Let Girls Learn." How Awesome Is That! Such a great movement. If you would like to know more click here or visit letgirlslearn.peacecorps.gov/.